This is a 1930 Conn “Transitional” alto saxophone, one of the earliest variations to be found as the Conn saxophones evolved from the New Wonder Series II (aka “Chu Berry” horns) to the M-series saxophones. 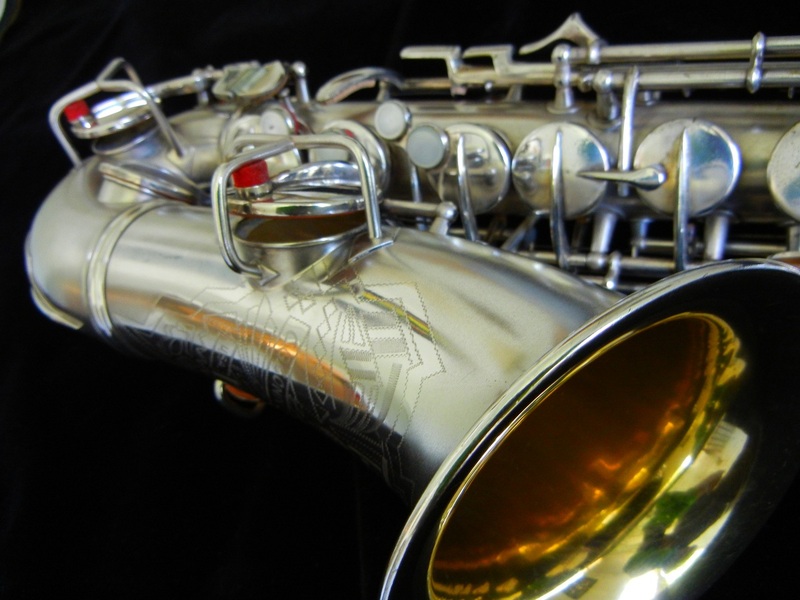 This saxophone has split bell keys, a microtuner neck, a New Wonder II style left-hand pinky table, and the rare art-deco style bell engraving. It is in nearly flawless original silver plate, in very good undamaged mechanical condition, and is scheduled for an overhaul with flat metal resonators. It comes in its original case. When finished, this will be a beautiful horn with a HUGE, powerful sound, as these transitional horns are known for. Once the overhaul is complete, I will add more pictures here. In the meantime, feel free to ask questions or reserve this horn if you are interested.